The ability to recognize and express empathy is a popular subject when autism is discussed. Many assume that people with autism lack this skill. However, is this really an accurate claim? First, I want to review how empathy is defined, and secondly, what empathy is in reality. Some common synonyms include: attuned to, commune, communion, emotional intelligence, empathetic, identify, project, rapport, relate, self-discovery, sensitive, sensitivity, and understand. Living with a person with autism means I am able to closely observe and learn about these types of topics. It gives me a privileged insight. Those who care for people on the spectrum know that they do not truly lack empathy; in fact, it is the opposite of that. The truth is, for those on the spectrum, it is so overwhelming to feel someone else’s feelings that often the only way to cope is to shut down, detach, and avoid the situation altogether. From an outsider’s point of view, it may look like that person is rejecting the other. This couldn’t be further from the truth. For neurotypical people, being able to empathize with others is a small, simple sensation. The most we will often do is cry or laugh for a minute as we share a sense of the other person’s reality. It helps if you have been through a similar experience. Yet honestly, it is impossible to really know what another person is feeling from an experience they had, as we all see and feel the world differently. Everyone has his/her own filtering system. For instance, while some may see a color, such as green, with such certainty, another will swear it is actually blue. We do this in everyday life situations, each of us experiencing something a little different from the other. This is what makes us unique. 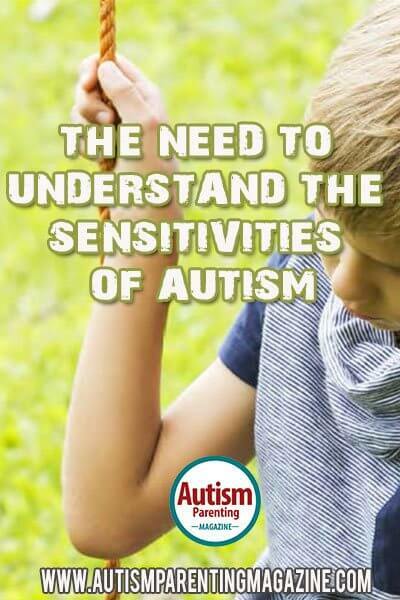 When you have sensitivities as heightened as those with autism, why would you choose to feel what others are feeling? For many, simply living through life on the planet and existing is enough. Outside stimuli from everyone and everything, including the environment, remains loud and is all-encompassing every minute of the day. Some have said to me that when they add the feelings of others to that on a one-to-one level, it is too intense and often debilitating. Alien feelings of someone else’s pain and anguish taking over every part of your being—I don’t know about you, but that sounds exhausting and scary. You see, it is not unusual for a person with autism to say that when they walk into a room, they feel EVERYTHING at once. Imagine that for a second, if you can; let’s empathize with that notion. However, most of us cannot empathize with it because we simply do not experience it on their heightened level. Does that mean we do not care? Empathizing with another human is deemed to be positive, a kindness. It’s the “right way to be” in order to be a socially-accepted, caring human being. Personally, I feel that empathy is useful only up to a certain point. Yes, no one person can fully comprehend what another is feeling—I have already mentioned this. But also, if we stay in empathy mode, no one gets anywhere past those feelings of pain. Instead, in unpleasant or traumatic experiences, it is surely more helpful to move people past their situations and help them begin to heal. Two people feeling the same levels of emotion can be counteractive. Surely compassion is more beneficial to another person when they are having a tough time. Let’s have a look at the definition of compassion according to the English dictionary: “sympathetic pity and concern for the sufferings or misfortunes of others.” Compassion’s synonyms include: sympathy, feeling, understanding, care, concern, solicitude, sensitivity, tender-heartedness, warmth, love, gentleness, mercy, leniency, tolerance, consideration, humanity, and benevolence. I have seen people of all ages with autism express kindness and affection when someone was feeling sad or hurting. Gentleness and tolerance in abundance is given from those on the spectrum. In fact, all of compassion’s synonyms (as listed above) are given without any fuss or expectation of anything in return. Compassion and love is given in its purest form, proving them to be completely selfless, without exception. Jeorge, our son, was three years old when he comforted a family member who was going through a really tough time. He did this by simply laying across his lap for an hour. Jeorge is nonverbal and did not communicate with words. Instead, he gave all of himself by lying across the lap of someone who was deeply distressed. He was comforting him so deeply and powerfully in silence in a way that was completely selfless. He gave an hour of his undivided attention and love. Over the years, I have listened to and read the books of others with autism and Asperger’s syndrome, describing how they find emotions very difficult to read. This can lead to an assumption that they don’t care about others’ feelings. The truth is, they found the energy of the emotion so powerful that often the sensory overload prevented them from acting in an obvious or expected way. There are many unseen kindnesses and acceptances I have witnessed over the last 11 years; they are so subtle that most miss it completely and focus only on the “learned, typical” reactions and interactions between people. I have seen those with autism hold a space for someone in distress—simply supporting them by not speaking or asking for an explanation, but instead, providing a loving space for the person to weep and simply be. Others have explained that they can feel energy and even see from the person exactly what is being felt, yet their words express something different. This is so intense for the person to feel and filter out that it is very difficult to be able to approach another, mostly because they fear of giving the wrong response. Yet I hear of many situations where a person with autism will hold a hand or stroke a cheek (one of Jeorge’s favorites). Nonverbal people with autism can give love and compassion without others noticing, as they can do this energetically while still carrying on with their usual activities. Compassion is given abundantly by those with autism. I see it every day with Jeorge. He does this without words and without a need for recognition from anyone. Being in the presence of a person with autism means you are not judged or ridiculed for anything. You are who you are…this is real compassion and real acceptance. It is selflessness in its pure form, asking absolutely nothing in return. A person with autism can see someone is sad and understands on a higher level than most of us. They realize that this is something the other person must deal with; action is not necessary. They accept someone having an emotional moment. This does not mean they do not care; instead, it means they acknowledge the need for space and support without fuss. Most psychiatrists and therapists know of this skill and the benefits of it. Remember, people with autism are incredibly sensitive beyond many of our comprehension. To feel as deeply and intensely as they are capable of means getting close is so overwhelming it can be nearly impossible for them to do so. This does not mean they do not care. The same notion is said for a non-verbal person. It does not mean they have nothing to say. It is when we stop projecting what we expect to see within the normal confines of love and consideration that we can start to see what is really going on. Expectation and the rigidness of such social interaction can cause huge misunderstandings between each other. This can be devastating for someone who is unable to use verbal language to explain their feelings. Personally, I have experienced such love and kindness from those with autism—meaningful, silent, gentle love. When I have been hugged or kissed by a person with autism I understand it; I feel the energy of their absolute undivided attention in a small, swift, unforgettable moment. It is like a blessing has been bestowed on me. I strongly recommend you try it! Throughout the 11 years that her son has been alive, she has researched autism through courses, books, and conducting meetings with those on the spectrum. Everything she speaks of in her workshops are from the mouths of those with autism and her personal experiences with Jeorge. Her passion and focus is mostly on the sensory area of autism—where she believes all carers and professionals should start before they consider academic teaching and social engagement. Kerrie Berroyer, born in Romford Essex 1970, now lives in rural Wales, Powys. In her early years as a professional, she worked in social services as a family support worker, in child protection, and as a special needs manager at a private nursery in Woodford. In 2005, she became a mum to a son who, in 2008, was diagnosed with nonverbal autism. Over those years, she became submersed in the autism world as a parent, acquiring support services for Jeorge and researching all realms of autism. Over a two-year period from 2009-2011, she volunteered as a camp leader with families with autism and horses. During that time, she hosted talks on camps, autism philosophies, and her personal experiences. In 2010, Kerrie began offering short workshops to undergraduate students at colleges across Powys. Most recently, she has launched her own website, Dazlious—“learning the language of autism.” Throughout the 11 years that her son has been alive, she has researched autism through courses, books, and conducting meetings with those on the spectrum. Everything she speaks of in her workshops are from the mouths of those with autism and her personal experiences with Jeorge. Her passion and focus is mostly on the sensory area of autism—where she believes all carers and professionals should start before they consider academic teaching and social engagement.